What do I do with my ps3 games that I just bought, do I have to buy them again If want it for the ps4 that I'm interested in? I bought some new games too but after seeing the ps4 and hearing specs on games and the system i look to the future and welcome ps4 the ps3 was great but with the ps4 coming i say greatness is coming i can't wait!!!!!!!!!!!!!!! Will the current dual shock 3 controller work with the ps4 console? $240.00 investment in 4 controllers for the ps3, be nice not to have to re-invest that again. The Last of Us for PS4? I don't have a PS3, I have an Xbox 360. Been thinking about getting a PS4 when it comes out. Because I really want to play The Last of Us. But PS4 isn't backward compatibility. Will a The Last of Us game be made to play for the PS4, because I'm not buying a PS3 just for one game. A lot of us Xbox men want to play The Last of Us, it'll be a good idea to make it for the PS4 also. I traded my Xbox 360 in just to play The Last of US, I don't regret it, best game I have ever played hands down, Also Uncharted 1, 2, and 3 were also great PS3 only games that I enjoyed playing, Just picked up Beyond: Two Souls a couple days ago, a PS3 only game as well ( I think) and really enjoying it. The only game I miss for Xbox, is Left for Dead 1 and 2, but The Last of Us is greater then Left for Dead. Consider trading it in, best thing I have ever done. is the ps4 compatible with Roxio game capture. I've just bought it for my son. should I return it? will the ps4 fit my gaems g155 mobile gaming environment? Here is a question for all of you Gurus. If PS 4 requires a subscription for online play ( which I think it will) Will a person need to be a subscriber to the PSN in order to receive system updates or game updates? I doubt it. I think it is just for online gold card type thing. Otherwise you should be able to update and patch the game free of charge. Its a new thing their adding to the PSN normal networks. I think you can still use your old psn network for Patches ect. but im not 100% sure but it probably will be okay. I was wondering how servers the ps4 will have compared to the Xbox one, which as 300,000 servers? whens minecraft coming out for ps3. also how uch is it going to be. I was told that new PS3 games can be upgraded to PS4 games for $10. 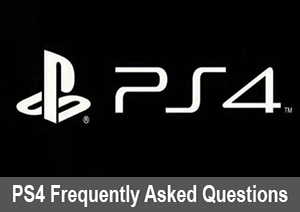 Does that mean the PS3 games can no longer be played on PS3 after the upgrade? I downloaded the digital copy and then had to return the ps4 for new one do I have to pay for the digital copy twice? What about my PlayStation Plus do I have to buy that again? is the ps4 mega bundle a limited one ? and will it have any other games other than killzone shadow fall ? Why is production of consoles not keeping with demand? Can anyone tell me if I get an external Blu-ray player and hook it up to my ps4 can I keep a game disk in it as well as another one in the internal drive so I can at least play two games without swapping disks? I have a bad feeling it will only look to the internal drive for the game disc...but maybe someone has tried this. Like many, I can't download these large games (a 20GB file would take like 40 hours and be limited to between midnight and 6am) so I'm stuck with getting them on disc. Any idea when the Fingersmith Guitar game will be out for the PS4? Do you need to have credit card to buy playstation plus or can you use any card? why is already a parental password on my ps4!!!!!!!!!!!!!!!!!!!!!!! i cant access almost anything!!!!! Is it alright with Sony to use a third party controller? Or is this a console ban offence? For example a PS4 controller that looks like/layout is like an xbox controller (i.e. a PS4 xbox controller). I had a game running while I went to the Playstation Store, and I looked at a couple of games, and now the games are being shown in a weird menu format where the trailer's playing in the background and things like that, and I have no idea how to reverse the effects. WHAT'S GOING ON?!? Ok every time I broadcast live on YouTube on my ps4 when I play the game its fine but when I watch it after it lags and glitches out how can I stop this from happing ? How do I cancel my free 7-day trial ?? Hey I have a question, I want to play Destiny on my ps4 but I have to update it first. And I use my phone data to play online, if I update it how many gbs of data would it use? Why cant i invite some friends who's online to a game? I know you all can't promise dates or release of games but come on... H1z1, dayz and arms just to name a few. What is going on here? Ive played rocket league on one of my accounts with it downloaded, but im creating a new account. I want to make a community about it but Rocket League just doesnt come up to choose. Does anyone know how to make it pop up as a choice for a game?